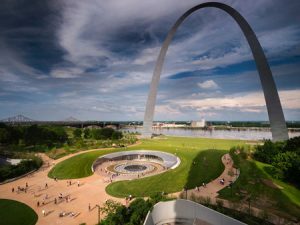 The new visitor center and museum at the Gateway Arch in Missouri was awarded Leadership in Energy and Environmental Design (LEED) Gold for its sustainability features. The newly renovated visitor center and museum at the Gateway Arch in Missouri have been awarded Leadership in Energy and Environmental Design (LEED) Gold certification. They have been recognized for sustainable site development, water savings, and building materials selection. Cooper Robertson and James Carpenter Design Associates, along with Trivers Associates designed the expanded and renovated space. low-emitting materials were selected to benefit the indoor air quality (IAQ).